The Day You Visit This ‘Heaven On Earth’ Will Be Seared Into Your Memory Forever! The Spanish name, ‘El Cielo’, translates into English as ‘Heaven on Earth’ and never was a location more aptly named. 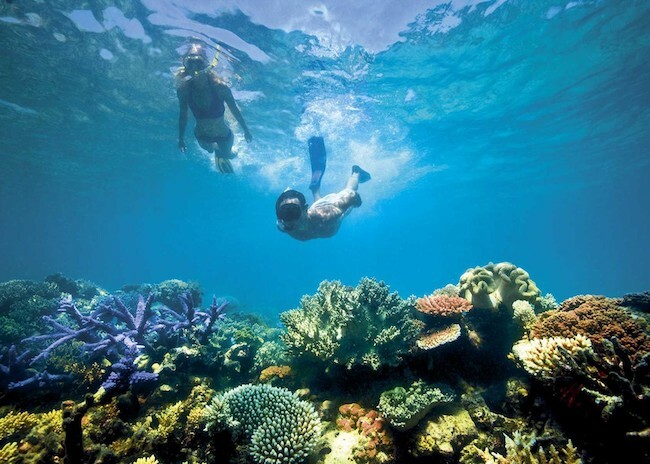 Because of that, it absolutely teems with a rich variety of marine life - in stark contrast to the relatively barren reefs which most of the snorkeling tours have to settle for, with far fewer fish and other species. But we are in a privileged elite as one of the very few licensed operators to fulfill the very strict ecological demands by operating ultra eco-friendly boats. And thus are allowed to enter the restricted marine life rich protected area forming Cozumel’s underwater wonderland – The Marine Park - in our glass-bottomed boats. When I'm back on the island I'm booking again!" When we arrived at our meeting point just across the street from our cruise pier we were welcomed as if we were family and immediately boarded the boat and the fun began right away. We snorkeled two reefs to see amazing marine life and the grand finale was a place called El Cielo, the most beautiful place in the world. When I'm back on the island I'll be booking again. Thanks Alberto and Pancho for a fabulous time. You’ll enter a different world of turquoise colored silence with the wonderful feeling of weightlessness – just as if you were flying. 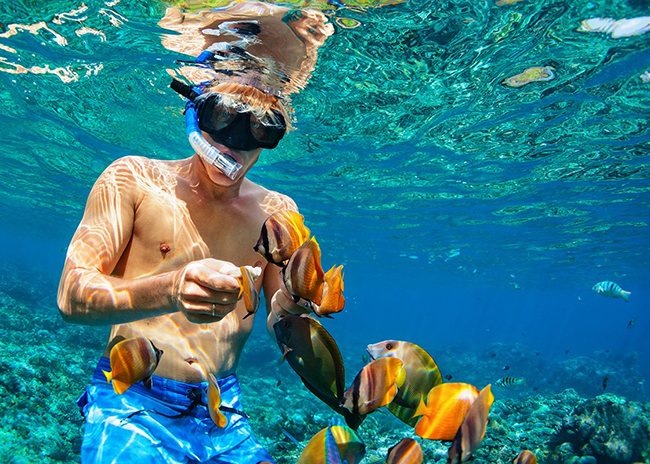 And, if this is your first time snorkeling in these protected waters, you’ll be stunned at the sheer volume and variety of the colorful tropical fish swimming among the impressive reefs of both hard and soft coral. We encourage this desirable state of affairs by feeding the fish! 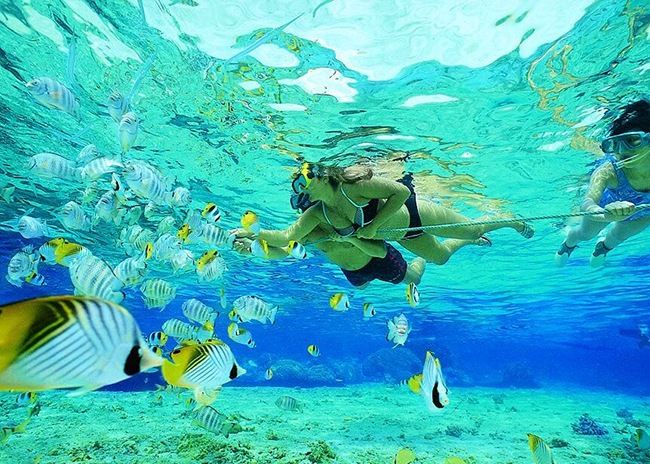 The Most Spectacular Snorkeling Reefs in the area lie within the protected Cozumel Marine Park area. 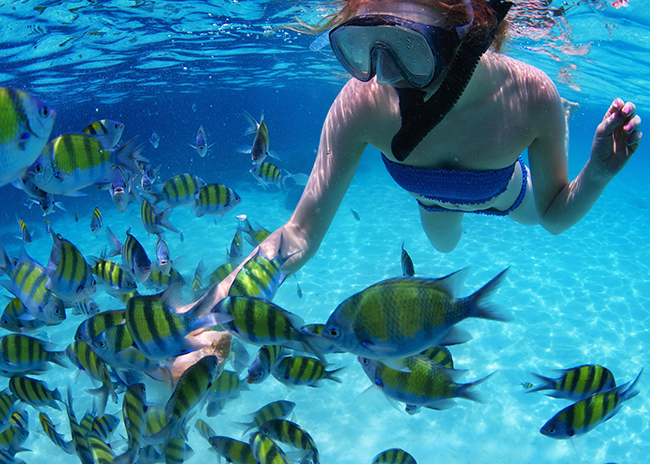 YOU'll visit a total of 3 different Snorkeling Locations. Which – needless to say – are 3 of the most astonishing among a whole area of spectacular reefs. Palancar Garden Reef is an impressive reef that consists of many different life forms. Many people who want to learn how to snorkel land in this spot. What makes this reef unique is the presence of very high coral systems that have many different living beings on them. As we already said, this is a picture that you will remember forever. While you are underwater, you will notice the beautiful sea turtles. They are very common in Palancar Gardens Reef. Besides, you will probably have a chance to see some butterflyfish, angelfish, black groupers and even some green moray eels too. 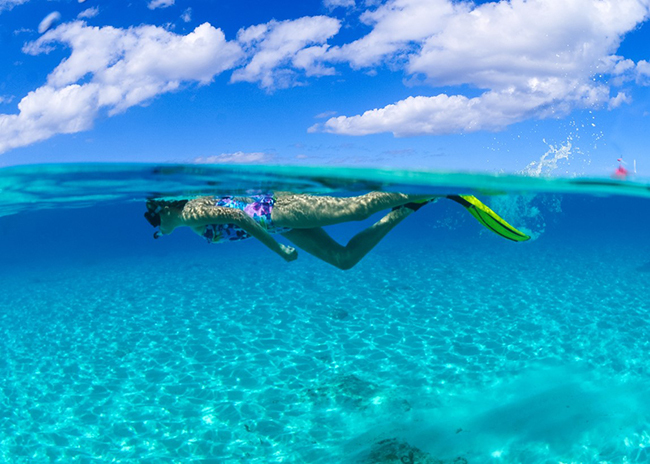 It is tough to say which reef in Cozumel is the best, but some things make this reef ideal for snorkelers. For starters, this reef is in an area that looks like a natural bay. As the name suggests, the water is not very deep, and the experience level needed for snorkeling in this area is beginner/novice. When it comes to marine life, this area blesses with extraordinary life forms. For instance, hawksbill sea turtles, as well as the green sea turtle, are probably the first thing you will notice in the waters. 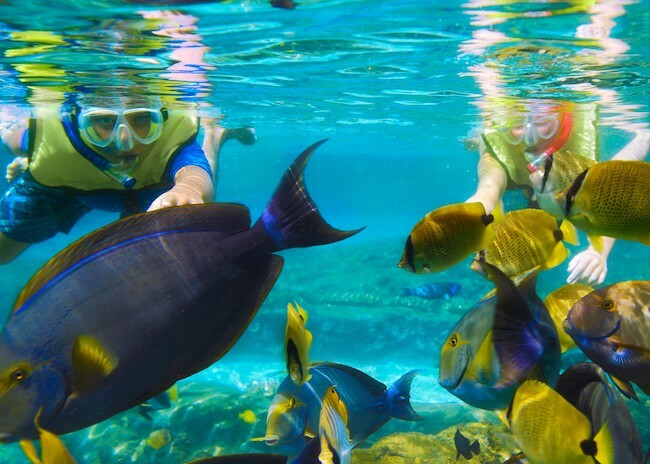 You'll also see moray eels, barracuda, octopuses, starfish, angelfish, grouper and other species of exotic fish. This colorful reef will spice up your holiday in Cozumel. That's for sure. After you’ve had ample time to enjoy a breathtaking snorkel trip around both the Palancar Gardens Reef and the Colombia Shallow Reef, we travel the short distance to the sandbar of ‘El Cielo’ – ‘Heaven On Earth’ - for our beach party finale! There you’ll be able to quickly understand why this magical spot is so aptly named as you drink in the magnificent beauty so readily visible in just four feet of beautiful turquoise, crystal clear water. At the same time your mouth will be watering in anticipation of the feast to come as your guides prepare fresh guacamole for you to savor. Ended the tour at El Cielo - White Sandy Beach, Blue Sky, Great Guacamole, Fruit, Beer and Drinks while listening to music"
Boat was there promptly to pick us up, smiles and good vibes from the crew that knows service is their game. The ride to the first snorkeling reef was about 20 minutes there we saw turtles, a ray and barracudas. The second spot was a shallow reef Alberto refers to as his "sacred garden" - kind a cute name for a place. We ended the tour at "El Cielo" a white sand, sky blue beach where we had great guacamole, fruits, beer and drinks while listening to music, playing on the water and making acquaintances with the rest of the group. Every day is a good day with Alberto! Every boat Captain and Snorkeling Guide (mostly my uncles and cousins) are Certified Snorkeling Guides and Speak excellent English, so your spectacular trip won’t be spoilt by having to struggle to understand what they are saying. Because – in situations like this, when safety must be paramount – it’s vital you immediately understand every word your crew says, without a second’s doubt or hesitation. 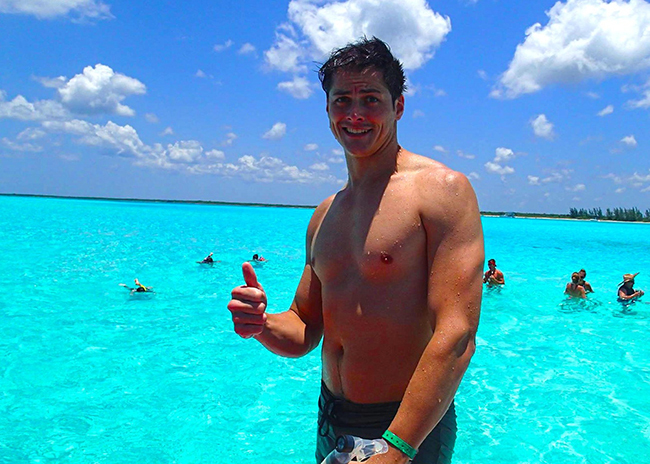 Hi … my name is Alberto Novelo and I and my close family have been providing snorkeling tours in Cozumel for well over 20 years. During that time, we have delighted multiple thousands of snorkelers, many of whom return again and again and have become firm friends. 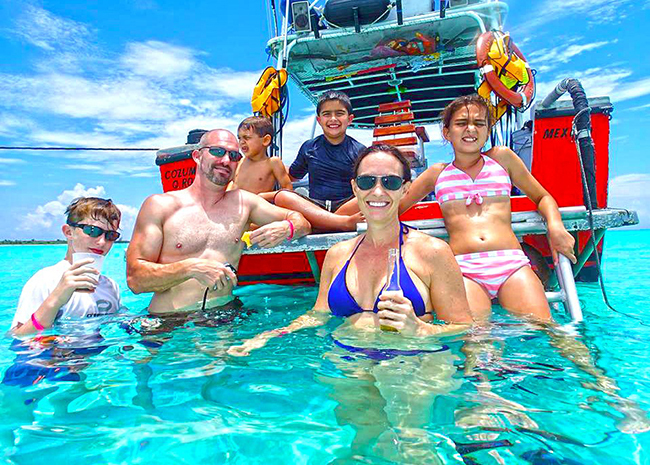 What’s more, because this is a family business – not staffed by disinterested employees – every single member of my family is dedicated to making your snorkeling trip a memory you will cherish. So determined are we to ensure you enjoy the best possible experience on this wonderful day, we strictly limit our 22 person capacity boats to a maximum of 12 passengers. This means we can give each and every one of you the personal attention you deserve as our VIP guests, particularly if this is your first time swimming underwater. We saw another boat with over 20 people and I was relieved to be on a trip that was more attentive and organized"
Alberto was a great guide, very positive, funny, energetic and a great diver. 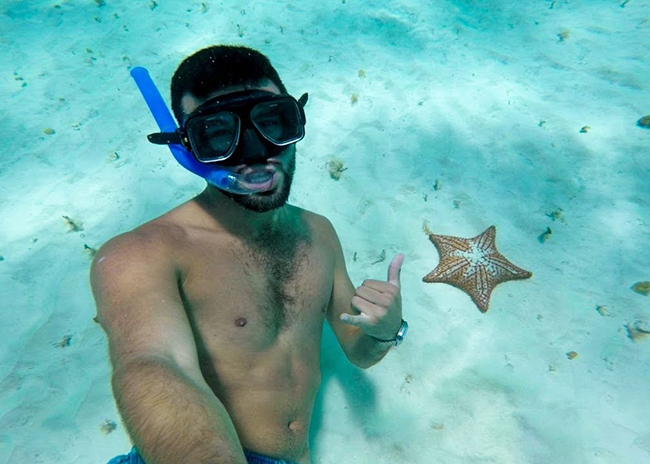 He pointed out stingrays, conches, sea cucumbers, starfish, and many types of colorful fish. The water is gorgeous and the reefs are amazing. Pancho was a skilled boat driver. We saw another boat with over 20 people on the snorkel trip and I was relieved to be on a trip that was more attentive and organized. Alberto also sent me pics from the trip since I did not bring an underwater camera. I recommend bringing an underwater camera since there is so much to see. I wouldn't hesitate to book a trip with these guys again! Thank you! Highly recommended! What sets us apart from other El Cielo tours in Cozumel? We are a family run and staffed business - and thus so far more interested in making your day wonderful in a way no employee could ever manage. 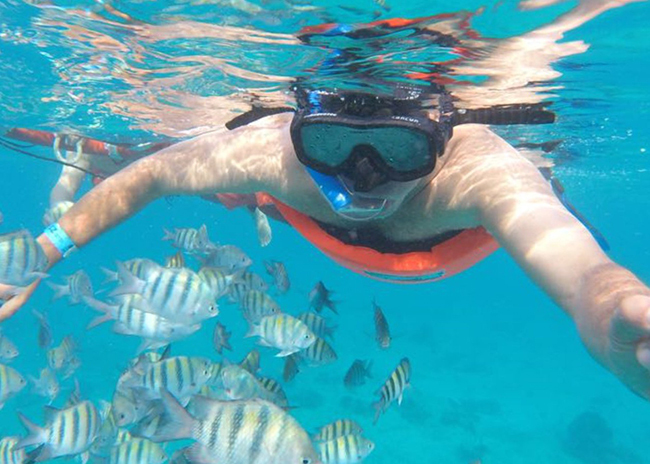 We are one of the elite few tour companies authorized to visit the most stunning reefs, which are located inside the protected area of the Cozumel Marine Park. That is Palancar Garden Reef, Colombia Shallow Reef, and the famous El Cielo sandbar. Although our boats are designed to safely transport 22 people, we set a limit of 12 passengers, so we can give every one of our VIP guests a five star service and they have ample room to relax on our comfortable seating, which is carefully shaded for your maximum comfort. 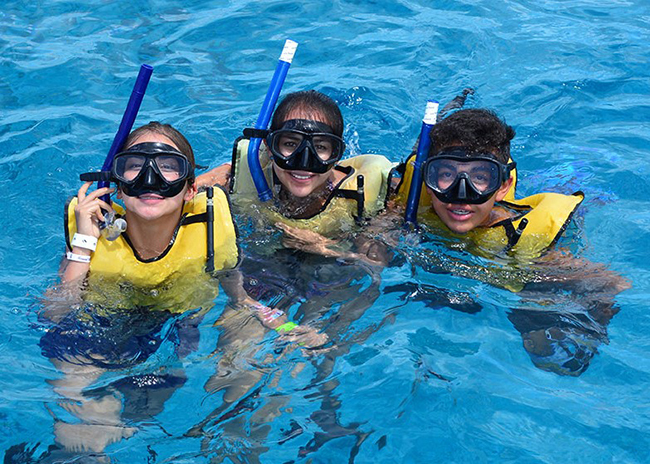 We not only allow you to bring your infants, aged one and upwards, we also allow your children aged 3 and upwards to snorkel. They must all be supervised by one of your party at all time, however, a member of our crew will also be close at hand when under the water for extra safety. First Time Snorkeling, so we were a bit nervous - But from the moment we stepped on Alberto's boat all apprehensions vanished"
El Cielo Tours was great in every way. Their website, their responsiveness, and especially the owner/guide Alberto, who was just outstanding. 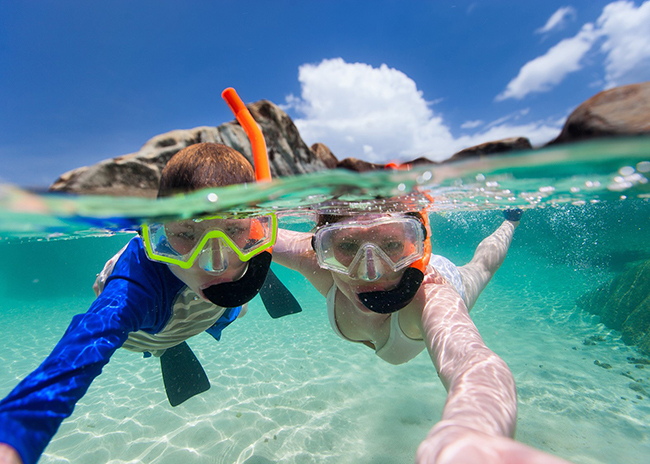 Even if this is your First Time Snorkeling, YOU will enjoy an Extraordinary Adventure that few other excursions can match! This was one friend's First Time Snorkeling, so Pancho stayed with her the whole time and made sure she was Safe"
I just want to say what a great time we had with Alberto and his crew. The weather was fantastic and the water just as amazing as I remembered from last year. This was one friend’s first time snorkeling, so Pancho stayed with her the whole time and made sure she was safe. We saw a shark, ray and sea turtle among a lot of other beautiful fish. At El Cielo the guacamole was delicious as were the Coronas. I totally recommend this if you like to snorkel and have a great time. Guacamole, Salsa (Pico de Gallo), & Chips. 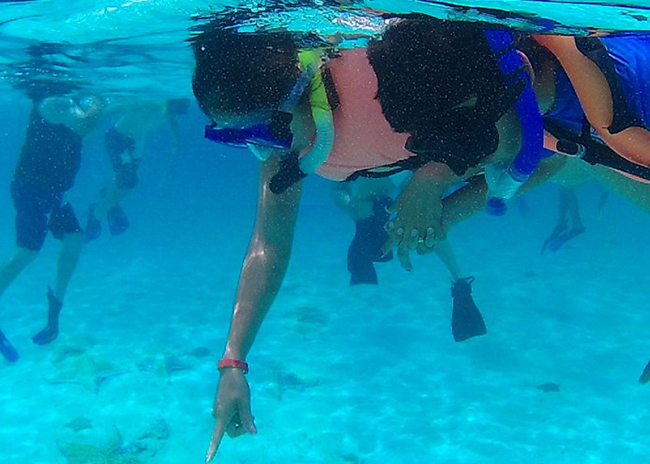 Snorkeling in 2 reefs in Cozumel's Marine Park (Colombia Reef & Palancar Gardens Reef). Swim Party at Famous El Cielo sandbar. Ferry transportation when coming from the mainland (Playa del Carmen or Cancun). 3 different stops (2 Shallow Reefs + El Cielo sandbar). Yes, our Dive Instructors speak English. Your choice of 2 convenient start times: 9:30am; and 11:00am. Your tour lasts approximately 4 ½ hours. Coming from Playa del Carmen or elsewhere on the mainland? Perfect, because you’ll arrive at the Cozumel Ferry Pier, which is just a few minutes away from our meeting point by taxi (and all the taxi drivers know where the ‘Marti Sports’ is). We meet at 9.30am or 11:00am and the tour lasts approximately 4 ½ hours. We literally just walked 50 yards to our meeting point where these guys were waiting us"
These guys definitely live up to the reviews on Trip Advisor. We arrived in Cozumel and literally just walked 50 yards to our meeting point where these guys were waiting on us. Pancho, and Alberto did a wonderful job as our guides. We saw sea turtles, many tropical fish and even a baby shark. After snorkeling, we headed to the one of the most beautiful natural swimming pools on earth, El Cielo, for a pleasantly relaxing time with drinks and fresh guacamole dip made by Pancho and Alberto. 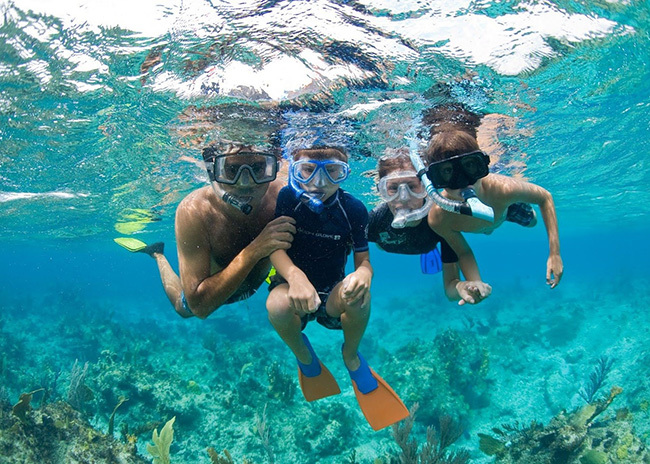 I will definitely recommend to family and friends a future excursion to Cozumel. Once you step aboard our glass bottomed boats you’ll be struck how clean and ‘shipshape’ everything is. And you’ll be delighted to realize you can understand every word our captain and crew say. Feel your excitement explode as the powerful eco-friendly engine revs up and we cast off to begin your adventure of a lifetime! You hardly notice the short trip to the Marine Park because you’re absorbed in the crew’s demonstration of how to use the high quality snorkeling equipment. You’re kitted out and ready for your first dive to see the beautiful Columbia Shallow Reef and the Palancar Gardens Reef inside the closely protected Cozumel Marine Park – where very few other tour boats are allowed. And, no matter how many times you’ve snorkeled before, nothing will have prepared you for the dazzling beauty you see in the warm, crystal-clear waters below – a stunning panorama of bright corals, astonishing sea plants in vivid colors and amazing shapes and fish so exotic it’s hard to believe you are still on planet Earth. All too soon, it’s time to get back on the boat for our short trip to the other reef. But there’s time enough to sit in the shade and excitedly discuss with the other snorkelers what you’ve all just experienced. And after a cool drink, you’ll be more than ready to get back in the water and inspect our next reef, aptly named: ‘El Cielo’ - Spanish for ‘Heaven On Earth’. So, if you thought the first two reefs couldn’t be surpassed, you’ll be delighted to realize how wrong you were, because I’ve saved the best reef until last. But, even when you get back on board and are relaxing with another drink in the welcome shade of our awnings, there’s still the highlight of the tour to come. And that’s our beach party on the famous El Cielo Sandbar, to round off a memorable day. Here you’ll enjoy more drinks and our freshly prepared guacamole, salsa and chips. Astounded at the amazing value you’ve enjoyed, all too soon you’ll find yourself back on shore, astonished at how much fun and adventure you’ve crammed into less than five hours. As a result, you’re probably already planning your next trip with us, like so many others before you, who return again and again. By booking Online directly with us, we are able to keep your fees down to rock bottom, while providing you with a true five-star experience. 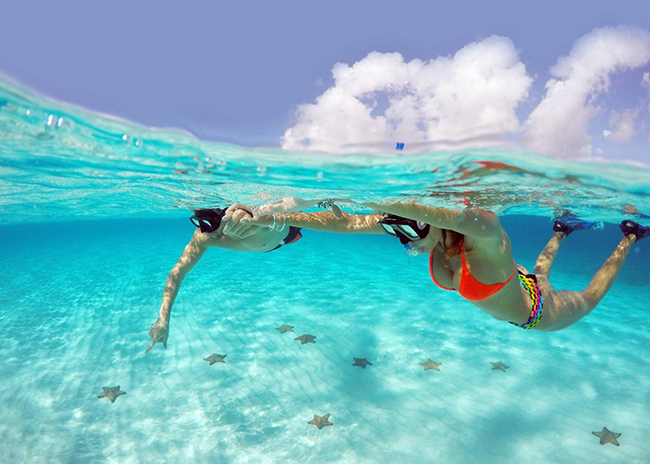 Last week 216 Travelers booked our Tour to enjoy snorkeling alongside Starfish at El Cielo Beach. Today it's your turn. Despite this, the eco-friendly nature of our high end glass-bottomed boats, fully equipped with shading and comfortable seating for 22 qualify us to operate ONLY 3 boats. 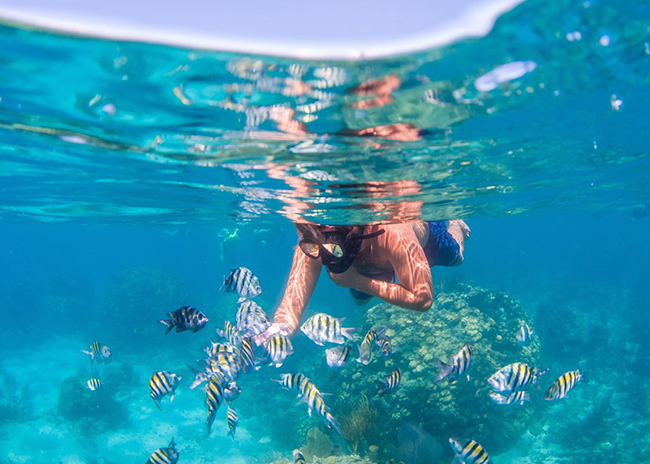 And, because we are one of very few businesses able to provide the highest quality snorkeling experience and most of our clients come from the cruise ships, bringing in around 20,000 cruise visitors daily - we tend to get booked up lightening fast for every day of the week. You can either pause and take ages to ‘think about it’ only to come back later and be dismayed to see your choice of day has been taken. That means, if you only have that one day for your trip, you’ll either have to forgo the trip entirely or have to settle for a second rate trip which will NOT include the marine life rich reefs of Palancar Gardens and Colombia Shallow Reefs plus the beach party on the beautiful ‘El Cielo’ sandbar. 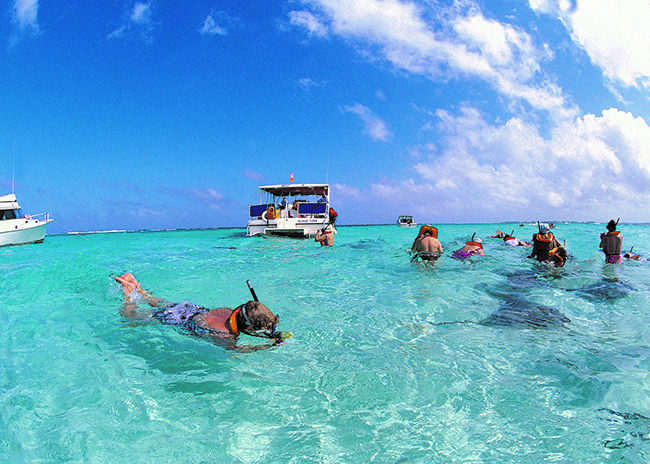 You can make the smart move and decide right now which day you want to become the memory of a lifetime by booking our El Cielo Snorkeling Tour that visits the awesome Cozumel Marine Park with its spectacular marine life and finishes in a setting to die for – the aptly named ‘Heaven On Earth’. Then, once you’ve made your booking, you’ll experience a wonderful feeling of calm, because you’ll know you’ve made the right choice. So you can relax and look forward to that magical moment when you step onto our boat. I and all my family are eagerly looking forward to welcoming you to Cozumel and showing you our wonderful Marine Park first hand! Over 210 Travelers just last week rated this Tour 5 stars. Are you going to miss it? But, despite enjoying our fair share of the very limited licenses empowering us to enter the beautiful protected area of the Cozumel Marine Park, we often have difficulty coping with all the bookings from the 20,000 cruise passengers that arrive in Cozumel daily. I’d bitterly regret it if – now you know what a wonderland the Marine Park is – your hesitation in booking means you are denied the full experience only a PREMIUM snorkeling service like ours can provide and you have to settle for second best. When you get back you want to go back out the next day!" Alberto provides an excursion like few others. 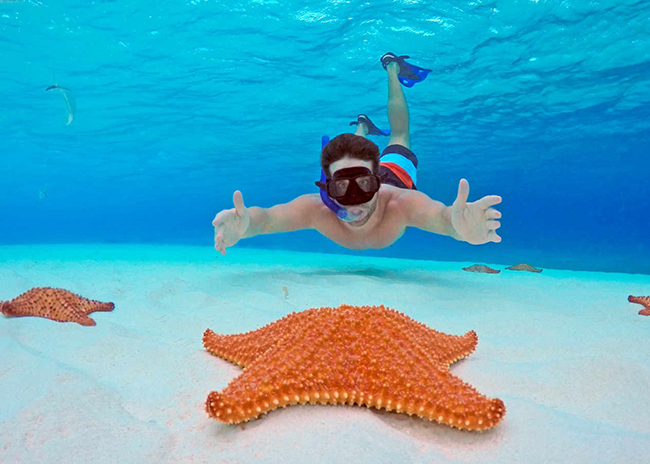 He takes care of the details so you enjoy a carefree day of snorkeling and basking in the clear blue waters off Cozumel. So, if you are looking for relaxation and the chance to see things you only imagine or see on TV this is your guide. Alberto makes it fun and when you get back you want to go back out the next day...with Alberto... Enjoy the trip. Can't tell you all we saw but we saw a lot including a nurse shark and sea turtles.